Vaccine Mandates Results Don’t Safeguard Children’s Rights or Health: How Did We Get Here? For decades, the U.S. government has made compulsory childhood vaccination one of the cornerstones of its public health policy. Outside the U.S., countries’ vaccination policies range from completely voluntary to “aggressive,” with some nations promoting vaccination but leaving the decision up to the individual, and others pushing a little harder by financially incentivizing vaccination. Some of the countries with mandatory vaccination have “modest” policies that focus on a single vaccine such as polio, and some—with broader mandates on the books—choose not to enforce them. Regardless of the policy, no other country requires as many childhood vaccines as the U.S., but the legal edifice shoring up the compulsory childhood vaccine program is surprisingly flimsy. 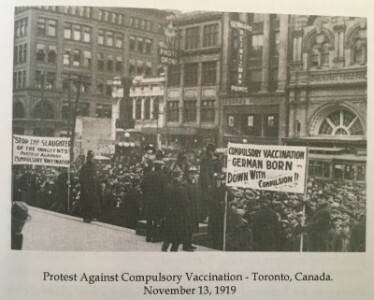 As New York University legal scholar Mary Holland explains in a 2010 working paper, this edifice relies primarily on two century-old Supreme Court decisions—from 1905 and 1922—and on the game-changing National Childhood Vaccine Injury Act (NCVIA) of 1986, which fundamentally altered the legal landscape for vaccination by exempting vaccine manufacturers and medical practitioners from liability for childhood vaccine injuries. …current childhood mandates are not only radically different from what the earlier courts and legislators envisioned but are unreasonable and oppressive and have led to…perverse results that do not safeguard children’s rights and health. The 1986 Act, in particular, resulted in an absence of legal protections for vaccinated children that is “striking compared to almost all other medical interventions.” Examining the legal trajectory of vaccine mandates since 1905, Holland argues that current childhood mandates are not only radically different from what the earlier courts and legislators envisioned but are “unreasonable and oppressive and have led to…perverse results” that do not safeguard children’s rights and health. In 1916, Alabama and Kentucky courts affirmed states’ right to mandate vaccination for prevention of smallpox epidemics, stating that state Boards of Health “are not required to wait until an epidemic actually exists before taking action.” The Alabama court also broadened the rationale for mandates beyond adults to children. Decisions in Mississippi and Texas in the early 1930s granted public health authorities the leeway to define public health emergencies in whatever manner they saw fit. According to Holland, the creation of the Centers for Disease Control and Prevention’s (CDC’s) Advisory Committee on Immunization Practices (ACIP)—“a federal advisory body with little public participation and no direct accountability to voters”—laid the groundwork for far more coercive vaccine policies. In fact, ACIP has become, over time, the “driving force” behind vaccine mandates. Whereas Jacobson justified mandates under specific and rare circumstances, ACIP has created an “infrastructure” that pushes mandates for any vaccine-preventable illness. Holland identifies the paradox at the core of the 1986 Law. 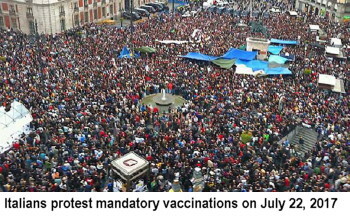 On the one hand, the legislation “for the first time publicly acknowledged that universal compulsory vaccination is likely to cause permanent injury and death to some infants and children”; on the other hand, it forces healthy children to give up ordinary legal protections, including informed consent, and takes away from injured children the right to sue manufacturers directly. The pharmaceutical industry has been the most profitable industry in the U.S. since the 1980s. There are more full-time pharmaceutical industry lobbyists on Capitol Hill than there are legislators in both Houses of Congress. The leading manufacturers of childhood vaccines in the U.S. (Merck, Pfizer, GlaxoSmithKline and Sanofi Pasteur) have records of documented fraud and criminal/ethical misconduct. Fortunately, the public and even some health professionals are growing increasingly wise to this industry-government shell game. In one community, opposition to human papillomavirus (HPV) vaccine mandates recently put public health authorities on the defensive about the epidemic of autoimmunity in today’s youth, the “exorbitant” amount of neurotoxic aluminum in vaccines and the requirement to “get a vaccine for something that can’t be caught in a classroom.” A parent responding to the news article stated, “Why should I as a mother trust the Public Information Officer for the state Department of Health when he cannot even name the amount of aluminum in the vaccine?” Thus, it is up to the public—and ethical professionals—to engage in the “scrutiny and skepticism” that the U.S. government has unconscionably failed to exercise.